Tipping waiters, bartenders, hotel maids, cab drivers and other service professionals is customary in the United States, even thought it may be a foreign concept in other countries. The word "tips" is not a word at all (technically), but an acronym that stands for "to insure prompt service". For certain service professionals, such as restaurant waiters and waitresses and cab drivers, tips make up a large portion of their salary, so when you don't tip appropriately, that nice young man who waited on you may not be able to pay his rent, and no one wants that. Here's our guide that shows you who you should tip, and how much is appropriate. 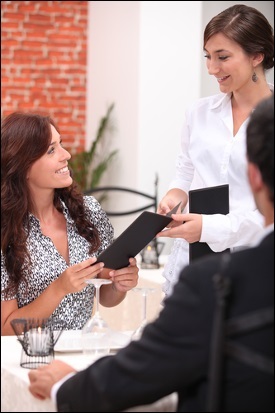 Of course, you can tip even more if you really loved the service you received. Waiters and Waitresses - between 15% and 20% of your bill (pre-tax) leaning more toward the higher amount thanks to the rise in the cost of living in NYC. An easy way to figure out the amount you should tip is by doubling the NYC sales tax imposed on goods and services which is 8.875%. Bartenders - $1 tip for every drink you order when you're sitting at the bar or order directly from the bartender. However, if you've ordered a $17 Martini at the Rainbow Room, you might want to give more. Baggage Handlers - $1 per bag is appropriate for both the curbside baggage handler who takes your luggage when you arrive at the airport and the baggage handler that carts your luggage from the carousel to curbside. If your luggage is Louis Vuitton, you may want to give more. Bellhops - $1 to $2 (high end hotel) per bag is appropriate. Hotel doorman - $1 for hailing a cab. Concierge - The size of the tip depends on the difficulty of your request. Dinner reservations and tour bookings, $3 - $5. Tickets to that hot Broadway show $10 or more. Housekeeping - $1 to $2 per day of your stay at a typical hotel. If you're staying in a suite at the Plaza, as much as $5 per day may be more appropriate. NOTE: You should leave a tip daily. The same person will not clean your room throughout your stay. Room Service - The typical tip of 15-20% of the bill is appropriate, if the hotel did not include a room service charge on the bill. Taxi Drivers - between 15% and 20% of your fare leaning more toward the higher amount, especially if you've made stops or the driver has handled your luggage. Car Service/Limo Drivers - between 15% and 20% of your fare and a luggage handling tip if appropriate. NOTE: If this service was arranged by your travel agent or the hotel, a tip might have been included in the prepaid bill. Door-to-door shuttle Drivers - For paid shuttles, between 15% and 20% of your fare and a luggage handling tip if appropriate. For free shuttles, such as airport shuttles between terminals, no tip is expected. Valet and Parking Garage Attendants - $2, or more for the Ferrari. Hair Stylist - Between 15% and 20% of your bill, even more if you look fabulous. Shampoo person - $2 is appropriate. Manicurist - Between 15% and 20% of your bill learning toward the higher amount if she's applied nail art. Massage Therapist - Between 15% and 20% of your bill. If you really enjoyed your session, tip more. Washroom Attendant - It's up to you. Some type of Jar with a hand written note that says tips - Ignore that. As you can see, there are many opportunities to give a tip when you visit New York City, or any American city for that matter. What you ultimately do about tipping is up to you, but as a former struggling waitress, I'd like to thank you in advance for tipping my fellow New Yorkers. Free Tipping Table - Easy to use chart viewable on your smark phone. How to Choose A Restaurant in NYC - With so many to choose from, how to you pick a place to eat?